How can I filter my DNA Matches? DNA Matches are people who share DNA segments with you. Each DNA Match is thought to be related to you, with one or more shared segments inherited from one or more common ancestors. Filtering lets you view a subset of your DNA Matches at a time, focusing on those that match particular criteria, of more interest to you. Using the filter toolbar, you can combine multiple filters, and filter matches by additional criteria such as those that have a family tree, have shared ancestral surnames with you or have Smart Matches™ with you. The DNA Overview page displays a summary of your Ethnicity Estimate, and a summary of your DNA Matches, with a graphical breakdown of the matches according to the relationship; country of residence; and their ethnicities. 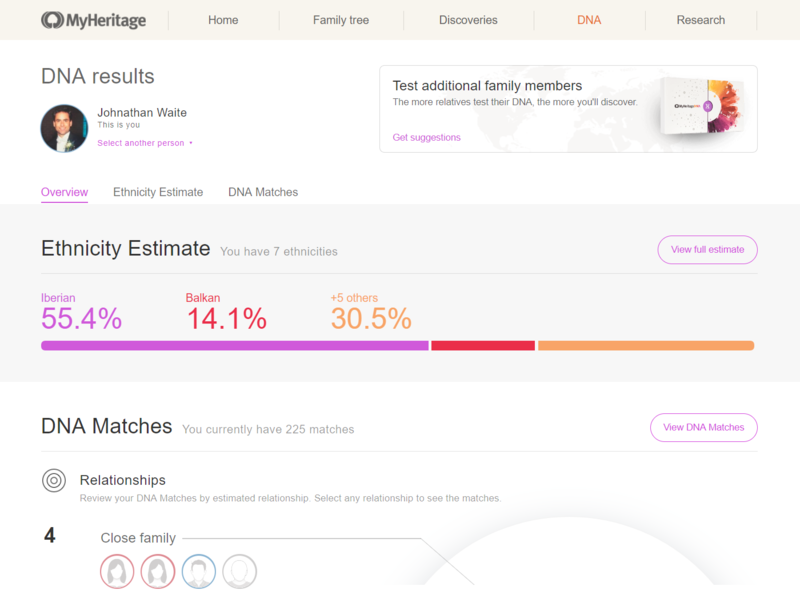 Using the Relationship filter, you can easily see how many of the DNA Matches are close family (immediate family through first cousins), extended family (first cousins once removed through second cousins twice removed), or distant relatives (third cousins and more distant cousins). Tip! Some users are more interested in close family matches, while others are intrigued to learn more about distant relatives. You can easily keep track of the number of matches you have in each category and immediately spot if you have new matches in any category of high interest to you. 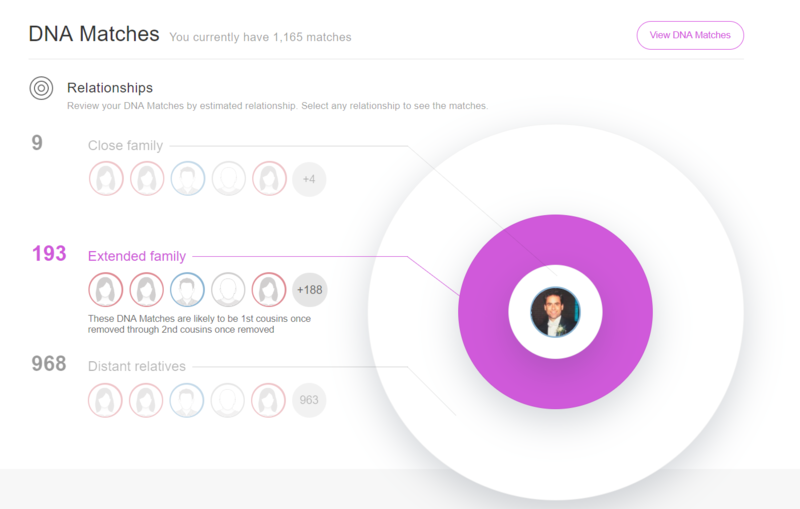 Clicking on either the category name or the corresponding ring will take you to the DNA Matches page, where the DNA Matches will be automatically filtered to show only matches from the relationship category you chose. This often reflects your ethnicity breakdown. 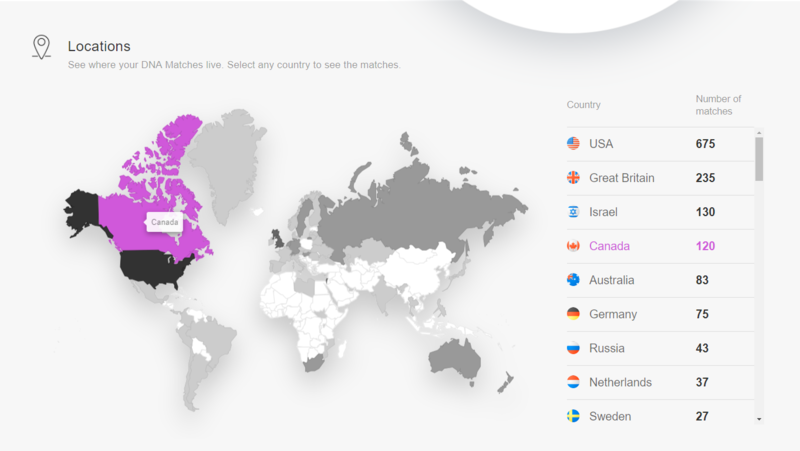 Clicking on any country on the map or in the list on the right-hand side will take you to the DNA Matches page, automatically filtered to show only matches residing in the country you chose. Note: for consistency, this filter is based on the country of residence of your matches, and not on family tree information such as country of birth. The country of birth may be very useful and it is sometimes different than the current country of residence, but it’s not available for DNA Matches without a family tree. The ethnicity filter will show you how many of your matches have each of the 42 ethnicities supported by MyHeritage DNA, where that ethnicity is meaningful and comprises at least 10% of the matching person’s overall ethnicity. The ethnicities listed at the top of the filter are your own ethnicities (sorted by percentage) because these are probably the matches you’ll want to investigate first. Some of your DNA Matches will be listed under multiple ethnicities. That’s why the numbers on the right-hand side, will sum up to a total that exceeds the total number of matches you have. 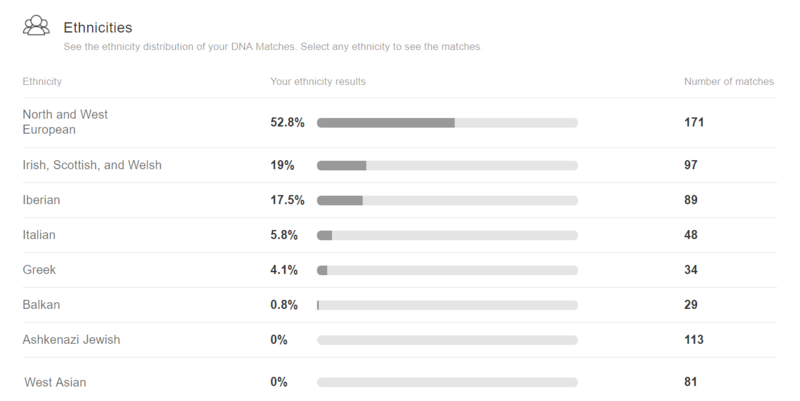 Clicking on any of the ethnicities will take you to the DNA Matches list, automatically filtered to show only matches that have that specific ethnicity (comprising at least 10% of their ethnicity estimate). Tip! If you have a particular ethnicity in your own ethnicity estimate that intrigues you, use this filter to look at your DNA Matches having that ethnicity. Perhaps you will be able to identify how they are related to you, and this way find out which of your ancestors brought you that particular ethnicity. The Filter toolbar is part of the DNA Matches page, and it appears automatically if a filter is active. In all the examples shown above, the DNA Matches page was reached when a particular filter was activated from the graphical filters in the DNA Overview page, and it was shown in bold in the Filter toolbar. However, you can also access the Filter toolbar directly. The Filter toolbar gives you access to the filters described previously (Relationship, Location, Ethnicity), and you can now apply several filters concurrently. If more than one filter is selected, they will be applied inclusively (using AND logic, e.g. filter1 AND filter2 AND filter3). For example, you can filter your DNA Matches to see all your Extended family matches, who live in the Netherlands. Tip! Matches that have shared ancestral surnames with you, are matches that you may be able to figure out more easily how they are related to you, especially if the ancestral surname they share with you is a rare one. In the Relationships filter on the Filter toolbar, you can filter your matches by their relationship to you, choosing to see only close family, extended family, or distant relatives. In the Locations filter, you can filter matches by country of residence. You can combine that with additional filters such as Shared ancestral surnames, to zoom in on DNA Matches of high interest. Tip! You can apply more than one filter simultaneously. For example, filtering by “Extended family” and “Irish, Scottish, and Welsh” ethnicity will show you which of your DNA Matches satisfy both of these conditions. 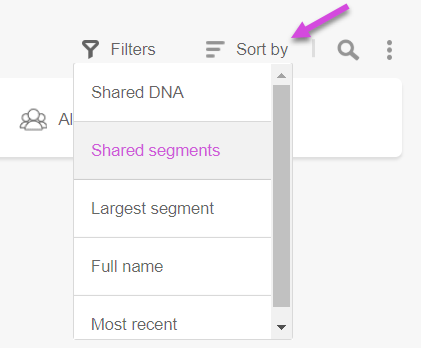 DNA Matches can be sorted by clicking “Sort by” and selecting one of the options from the drop-down menu; Shared DNA, Shared segments, Largest segment, Full name, or Most recent. By default, matches are shorted by Shared DNA, which means that the matches which whom you have more shared DNA are listed first. You can also apply sorting on matches that have been filtered. When searching for a name, matches with that name or having that ancestral surname will be displayed. Tip! You can combine searching with filtering. You can search among the matches you’ve previously filtered. Or you can run a search, and then filter the search results.